Preface: This is the second of four posts by Boyle Heights Historical Society Advisory Board member Rudy Martinez on the early 1880s introduction of electric street lighting to Los Angeles, including an arc lamp built at First and Boyle in Boyle Heights. The third and fourth installments will be posted next week. By early 1882, believing that too many streets were still murky and unsafe, Los Angeles citizens demanded a more comprehensive light system replace the inefficient gas lamps. Also, the city's influential business class was insisting on better illumination for their stores and properties, because of its potential to lure more outside capital investment. This demonstrated that Los Angeles displayed such big city ambitions as having public lighting, in addition to other public works like a new city hall and courthouse, both completed in the late 1880s. Indeed the Los Angeles Times would point out in an editorial on May 18, 1882 that “Eastern cities of the same size, and much less importance than Los Angeles, notably, Aurora, Ill., were already lighted with electricity.” As early as January 5, 1882, the Los Angeles Times, in its first year of publication, published an enthusiastic story about the “wonderful tower in San Jose” with the headline “ELECTRIC LIGHT – Los Angeles Wants and Must Have One.” Four days later, the Times published its first ever photo, this being of the San Jose light tower. 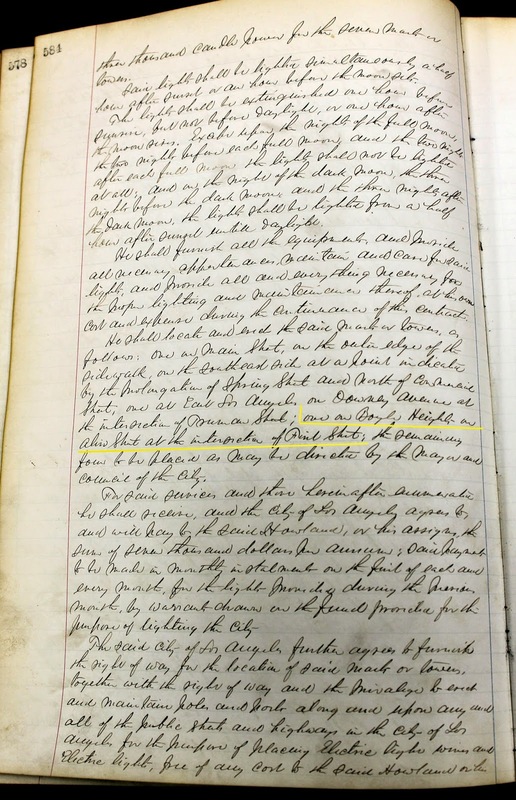 The original handwritten Los Angeles City Council meeting minute book entry specifying the location of the new electric arc light lamps, including the one, highlighted in yellow, specified for Boyle Heights. Image provided by the Los Angeles City Archives, which has the original minute book. Click on the image to see it in a separate window in an enlarged view. year contract from the city council to provide lighting by December 1st. The Los Angeles Times and the Los Angeles Daily Herald reported that Howland proposed to introduce electric light to Los Angeles with seven 150-foot tall uniquely-designed “light masts” at $1,000 per mast per annum. To be placed in the heart of the city and its settled suburbs, each mast would carry three arc lamps with a total of nine thousand candle power each. The contract stipulated the masts were to be lighted every night except on the night of a full moon, the two nights before, and two nights after. Appearing to closely resemble a re-purposed ship's mast, the Los Angeles City Directory 1886-1887 described the structures as “two sections of poles made of spars from Puget Sound, being about twenty inches in diameter at the ground and tapering to six inches at the top.” Furthering the resemblance to a ship's mast, existing photos show a workers platform on the light mast seventy-five feet above the ground. Ordinance No. 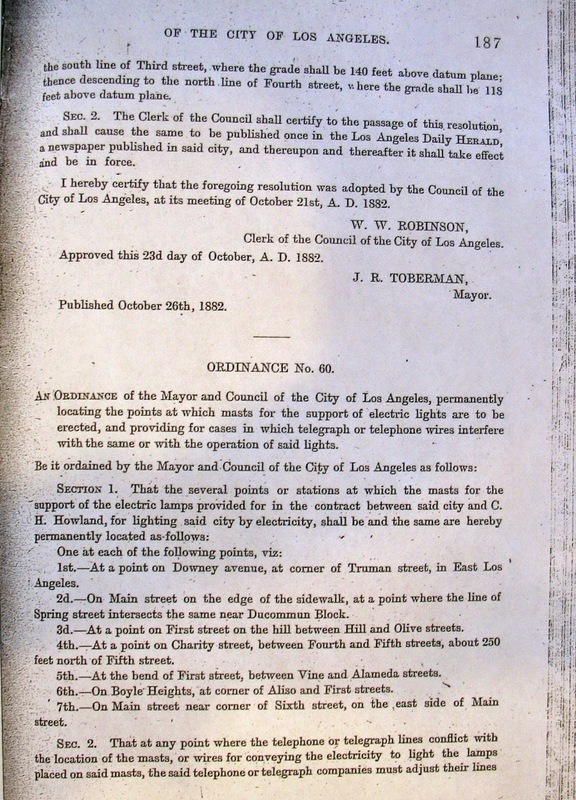 80 at the bottom of the page specified the location of the several electric arc light lamps to be installed in Los Angeles, including number six at the corner of Aliso and First Streets in Boyle Heights. Image courtesy of the Los Angeles City Archives, which has a copy of the printed ordinances. Click on the image to see it in an enlarged view in a separate window. Approved by the city council on October 26, the project’s ordinance established the seven locations for each mast. One was “on Boyle Heights, at the corner of Aliso and First Streets.” There is also a Boyle Heights connection to the light mast on the corner of Main and Commercial streets in downtown. It was at this location that Andrew Boyle owned Boyle's Shoe Store from the late 1850s to near his death in 1871. And as noted in the store's advertisements that ran in the Los Angeles Star newspaper in 1864, he also took orders on this site for his wine, which he named after the vineyard's location, Paredon Blanco, established by the López family in the Mexican period, which was developed as the suburb of Boyle Heights in 1875 by Boyle's son-in-law, William H. Workman. Mr Chandler stood for over a year and a half the sole champion for electric lighting in our city, with the other fourteen members of the Council arrayed against him. When the franchise was granted he inserted a claim for a mast light to be placed on the corner of First Street and Boyle avenue. Walter Moore, the genial fire chief, used to refer to this light as the light of Leon Los Nietos. However, under its rays have grown one of the most flourishing resident portions of our rapidly growing city, and this section will not soon forget its debt to Mr. Chandler. Very cool! I was born in Los Angeles and spent the first year of my life in Boyle Heights before moving to Montebello! Thanks for visiting the blog and for leaving the comment. We hope you continue to check back with us, including the final two installments of this post, coming early next week.